What is fiber and where can i get it? Fiber is roughage or indigestible carbohydrate. It is the portion of a plant food that cannot be broken down by digestive enzymes. Whole real foods contain the most fiber; therefore, a plant-based diet of whole grains, fruits, nuts, seeds, legumes, and beans is the most nutritious. Keep in mind, not all fibers are the same, so it is important to incorporate a variety of fiber sources -- not only fruits and vegetables, but also whole grains. For example, oats and barley are whole grains that contain the fiber beta-glucan, which helps manage cholesterol and blood sugar levels. In addition, the soluble fiber of oatmeal forms a gel in the stomach, delaying stomach emptying, and therefore making us feel fuller longer. Bran fibers – wheat, corn, and oat – are effective for preventing and treating constipation due to the high bulking effect and resistance to fermentation in the colon. In addition, whole grains provide more key nutrients including iron, zinc, magnesium, and B vitamins. Looking for different types of whole grains? How about whole or cracked wheat, farro, oatmeal, whole oats, popcorn, brown rice, spelt, freekeh, bulgur…just to name a few. An optimal diet can be achieved by getting fiber from fruits and veggies, whole grains, and other plant sources. Eating whole grain, high fiber breads is an easy way to reach your fiber goal. 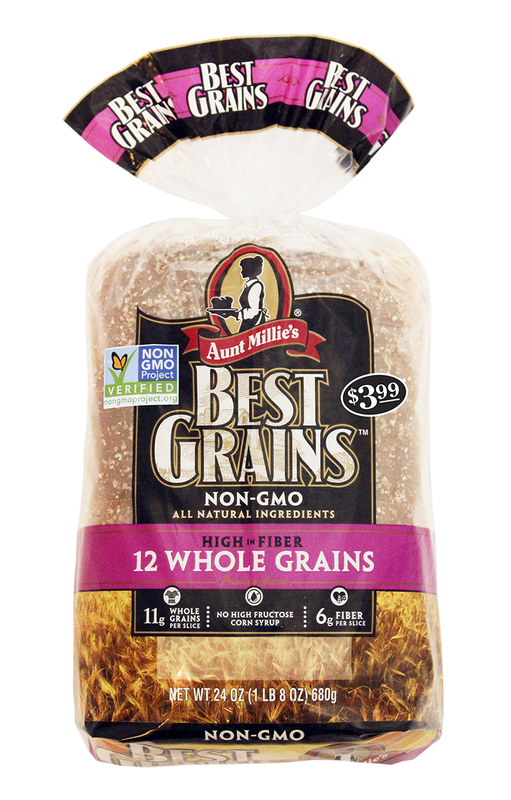 For instance, the Aunt Millie’s Best Grains Non-GMO Breads contain, per slice, 6 grams of fiber, 4 grams of protein and only 2-3 grams sugar, and the first ingredient is always whole grain wheat flour. My current pantry pick is the 12 Whole Grains variety, which contains oat fiber, millet, sorghum, oatmeal, flaxseeds, and rye. This high fiber, whole grain bread makes it easy to achieve the “magic formula” -- getting enough fiber in our daily diets, to prevent disease and maintaining good health.